October is an important month for book festivals—in Boston, Austin, Madison, Baton Rouge, and of course Frankfurt, Germany, which hosts the world’s oldest book festival. In honor of these book festivals, I want to delve a bit into the way that the language of books expanded the English vocabulary. The earliest books were not books per se, but inscriptions on stone or wood. The term stele, for an upright stone, wooden slab, or clay, is still a very specialized term. Soon, however, clay, wooden tablets, and papyrus scrolls made writing more portable. Fast forward to today, when tablets now refer to computers and we scroll on our computer screens, tablets, and phones. The meaning of both words has been extended to follow changes in reading technology. Clay tablets did not need tables of contents, but papyrus scrolls left us the term syllabus, which comes to us from the Greek word sillybos, a label affixed to a scroll giving its contents. The Romans used the term titilus instead, from which we get title. The scrolls themselves were kept in a wooden jar—stacking was not an option—which was known in Greek as a bibliothek (from biblion for “book” + theke meaning “case”), which has become the word for “library” in various languages. 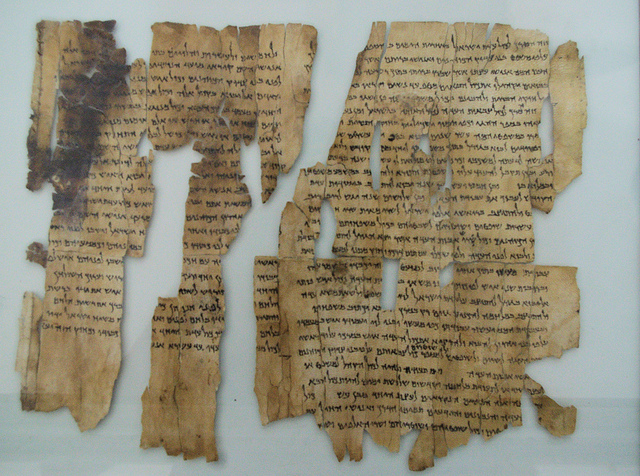 Image credit: “Dead Sea Scroll — The World’s Oldest Secrets” by Ken and Nyetta. CC BY 2.0 via Flickr. The prefix biblio-, of course, also shows up in a variety of book-related words—like bibliophile and bibliography. Bible is a biblio-variant that took on a specialized religious association but has been used figuratively to mean any authoritative book since the early 1800s. Less durable has been the word tome, referring originally to the cut scrolls of papyrus. Tome has the same root as atom or appendectomy and is used today to mean a physically or intellectually weighty book. Papyrus gave way to parchment and eventually to paper, which made its way from China to the Middle East to Europe. Early books were handwritten and hand-copied, giving us the term manuscript, which now simply refers to the original text of a work. In early manuscripts, uniform handwriting was at a premium (since a book might be produced by many scribes) and there was no modern punctuation. Instead, sentences were separated by making the first letter larger and sometimes coloring it red, a process known as rubrication. Later religious works included directions in red and rubric came to mean an established custom. In present-day universities, the word has evolved to indicate a scoring guide that lays out grading expectations. “Gutenberg Bible” by NYC Wanderer. CC BY-SA 2.0 via Flickr. 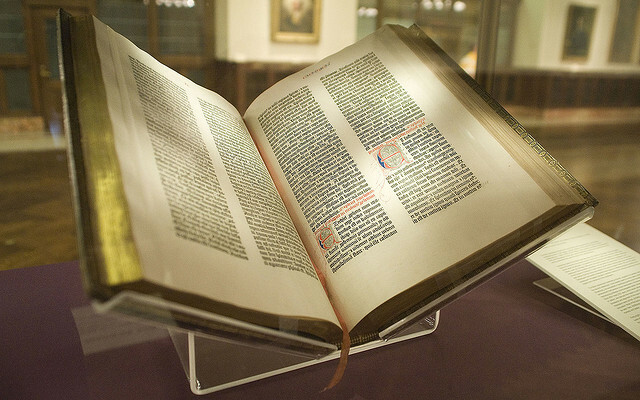 The insights of Johannes Gutenberg and fifteen other artisans revolutionized book production with uniform movable type, adapting the technologies of olive oil and wine making (the press) as well as coin and jewelry making (the fabrication of letters). The letters or characters used in printing were soon referred to as type, from the Greek word for “impression” or “mark.” Like all novel technologies, printing with movable type was quickly and continuously refined through the Renaissance and into the Industrial Revolution. In the eighteenth and nineteenth centuries, further technological innovations improved the efficiency of printing, moving from wooden presses to iron ones and from continually reset type to the process of stereotyping, where a mold was made of a page of set type. The mold could be stored and reused for future printings. A stereotype came to mean something repeated without change and later, a preconceived oversimplification. By the mid-nineteenth century, printmakers had developed a method of making uniform type automatically—a process known as type-casting, tripling the speed with which type could be made and setting the stage for automatic typesetting. It was not long before the meaning of typecast was extended to refer to the casting of actors in a certain roles. And by the late 1800s, we had the noun typewriter and the back-formed verb typewrite, later shortened to just type, bringing us full circle. So as you browse the publisher’s offerings at your local book fair—wherever that might be—take a moment to appreciate not just the words on the page but the words that printing and publishing have contributed to the English language. Image Credit: “Stockholm Public Library” by Samantha Marx. CC BY 2.0 via Flickr. Edwin L. Battistella teaches linguistics and writing at Southern Oregon University in Ashland, where he has served as a dean and as interim provost. 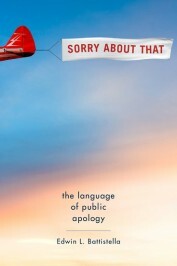 He is the author of Sorry About That: The Language of Public Apology, Do You Make These Mistakes in English? (OUP, 2009), Bad Language (OUP, 2005), and The Logic of Markedness (OUP, 1996).